I can not believe that today is the last day of January. Seriously this year is going to fly by so quickly. My daughter is already talking about turning six (her birthday isn't until November so she may be getting excited a little too early lol). How has everyone's January been so far? Apart from it going by quickly mine has been good. I've managed to catch up with lots of people and do some fun things with Olivia before school starts in a couple days. Eeek! I can't believe my baby is big enough to be going to school. Today I have my monthly favorites for January. I haven't fully decided what sort of format or things I am planning on putting in these monthly favorites at this point, so if I have missed anything that you would like me to include you can let me know. Now this month has been a bit "quiet" in terms of new products. I did order Orly's La La Land Collection back in December but for whatever reason they still haven't arrived. I've now re-ordered them from another company so they should be here soon - plus I have some other goodies that I have purchased so February should have some new things for me to share with you so yay! I love new things. This month has been full of nail art! 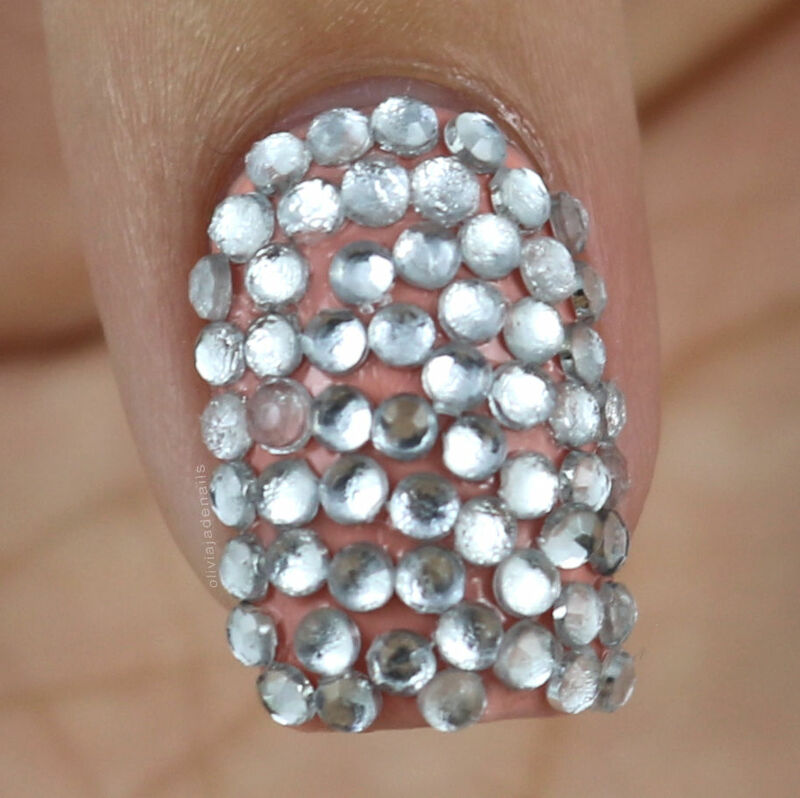 There has been a total of twenty four nail art related posts, how crazy is that? I really didn't realize that there was that many. I always have trouble narrowing down my favorites to four (I don't think it helps that I do so many manis in a month) so here are my favorite eight manis. The warmer weather certainly has made me break out a lot of bright colours! Seems we are talking about nail art I thought I should throw in some of my favorite nail art products I have been loving this month. I have a whole review on this plate which you can find here but long story short - there are a whole bunch of full sized images on this plate that I just love! It's definitely a very me plate. I do have a bunch of other new Lina plates that I want to use so I have had to stop myself from just grabbing this plate constantly. This plate is from Bundle Monster's Mystic Woods Set Two Stamping Plate Collection. There is actually few plates from this collection that I really like but the butterfly wings really make my heart sing. I can't wait to use this plate again! As I mentioned earlier, this month has definitely been very quiet when it comes to new polishes for me. I have however had a chance to swatch some more of the polishes that I purchased last year (yay for staying on track with my New Years Resolution!). I have also had a chance to rediscover some older polishes that I have worn before. This collection isn't a favorite of mine when it comes to wearing each polish as a full mani, however I do love the colours for nail art (as you can probably tell from my nail art collage above). You can see my full review of these here in case you want more of my thoughts. This is such a stunning colour and the formula is great. I think this one would have made it into my favorites of last year if I had actually gotten around to wearing it in time. This is another one of the polishes that would have made it into my favorites from last year. Seriously I need to stay on top of my purchased better this year! You can see more pictures of this polish here. This month I have also rediscovered my love for Matte Top Coats. I don't know why I don't use them more often. 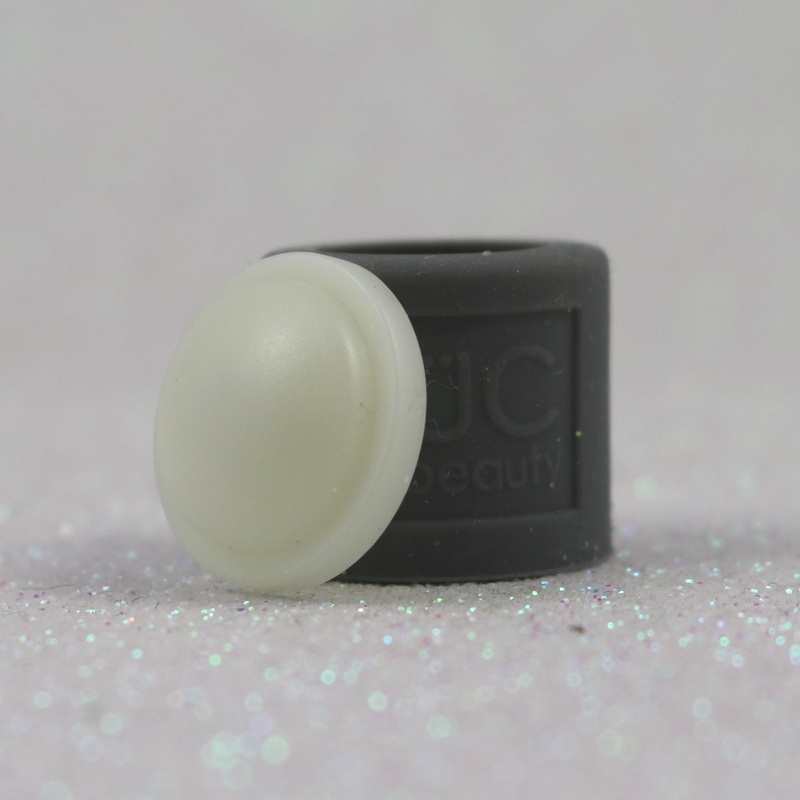 Brace yourselves - there will probably be a lot of matte manis coming! I thought it would be fun to include some of the things that you guys have been liking. These are my nine most liked pictures on Instagram for this month. It's great to know that some of my favorite manis are yours as well. I think that about covers everything that I have been loving this month. I am so excited for February. I should have a few new things to play with and of course lots more nail art to share with you guys. What are some of the things that you have been loving this month? Today is the last mani for the 30 Days Of Colour Challenge...well for this month anyway. I haven't seen the themes for February yet (or the dates) so I am not 100% certain if I will be joining in next month. I guess only time will tell. Anyway, today's theme is recreation. Now I'm really not sure if this prompt is going for a hobby type of thing or more re-creating someone else's mani. I am kinda going with both. I spend hours scrolling through Instagram and Pinterest looking for a mani that I wanted to do when I came across Ana's Manis recent blog post and thought it was the perfect mani. It's gorgeous! If you haven't seen Ana's work definitely check it out! For my base I used OPI's You're Such A BudaPest (which is such a stunning polish. I have fallen in love with it again). I then used OPI's Flip Flops & Crop Tops and Love Angel Music Baby for the followers and OPI Alpine Snow for the dots. I couldn't resist grabbing out OPI's Matte Top Coat for this one. I seriously need to do more matte manis. I'm so glad I saw Ana's mani and recreated it. Not only is it a gorgeous mani but it made me fall in love with OPI's You're Such A BudaPest and Matte manis all over again. Did you complete this challenge? It's time again to celebrate another Digit-al Dozen member's brithday. January is the birth month of Shelly (or Sassy Shelly as some of you may know her as) and she has picked this really colourful Galaxy design for us to use for our manis. Now if you have followed me for a while then you will know that I don't like Galaxy nails. I like them on other people but I don't like doing them at all. In fact, I will avoid them whenever I can. 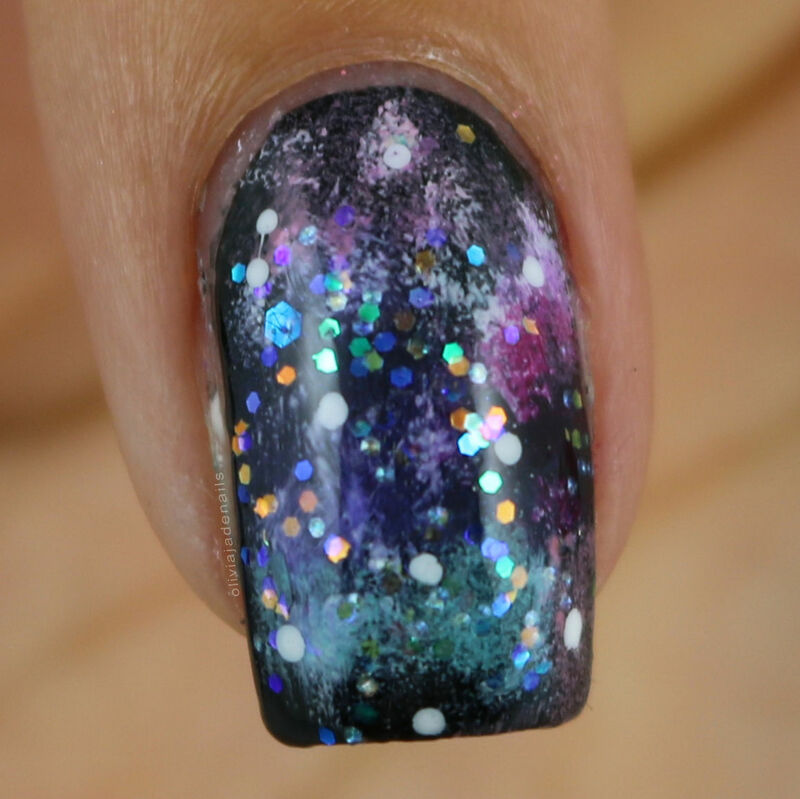 Apparently my time has come again to attempt another Galaxy mani. For my base I used Pretty Serious Cosmetics Absence, and then randomly sponged on OPI Alpine Snow. To continue the randomness I sponged on China Glaze's Seduce Me, I've Got A Blue Attitude, That's Shore Bright, DJ Blue My Mind, Neon & On & On, Too Yacht To Handle and Snow Globe. Lastly I added some random white dots. 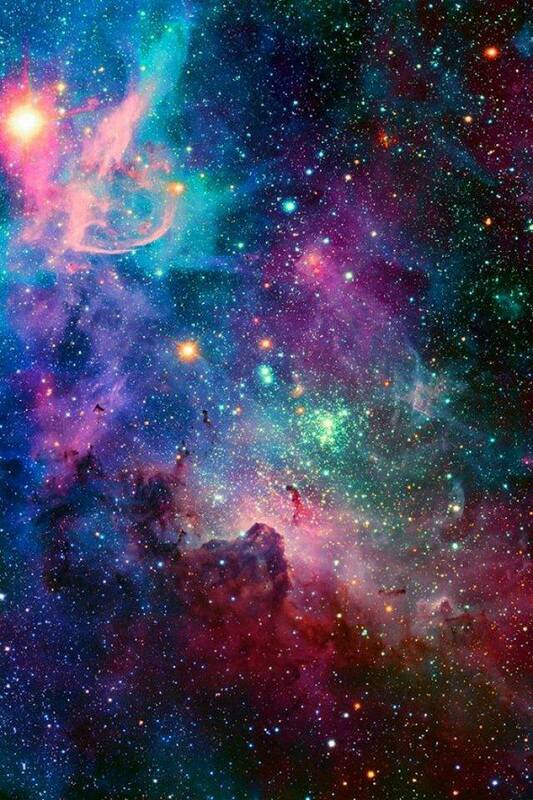 I really do like the Galaxy picture. 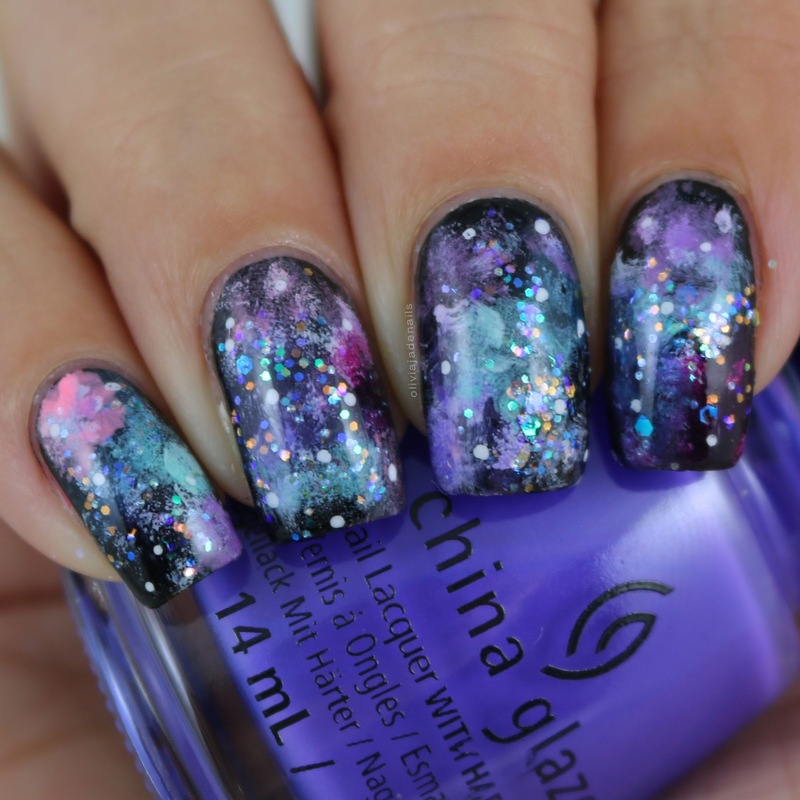 If I could magically get it on my nails then I would do that. I can't wait to see the other girls manis. Happy Saturday everyone! I hope you all have something fun or relaxing to do this weekend. I am actually off for a day of fun in Geelong with some friends of ours. It's meant to be good weather so should be a great day. Anyway, recently I received Uberchic Beauty's UberSwatchers to try out and share with you guys so let's take a look shall we? In case you don't know what UberSwatchers are they are polish swatcher toppers for your polish bottles and come in two parts - a hard white top and a flexible outer wrapper. Now why in the world would you need these? If you are like me, you may store all of your polishes in drawers and will know the frustration of not being able to see the colours you have without pulling them out. That is where the UberSwatchers can come in handy. As mentioned, the UberSwatchers come with two part - the white top and the flexible wrapper. They arrive joined together but are simple to separate so that you can paint them with your desired colour. Putting them back together however is a little more fiddly. It's not difficult, but definitely fiddly. The huge pro to these is that you can easily see what polishes are in your drawers which makes it a lot quicker to find what you are looking for. There are a couple of cons (in my opinion) of this. 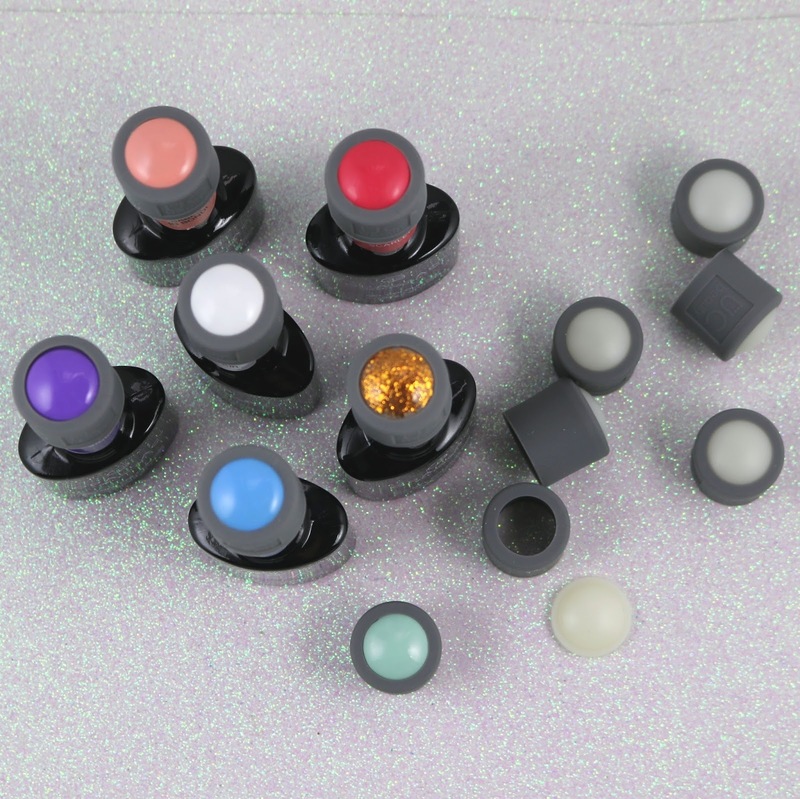 If you have a large collection you are going to be in for $$$$ to have UberSwatchers on all of your polishes (you will also be spending a lot of time swatching them all). The other downside is that these don't actually fit on all polish bottles. For me personally, I have no issues with seeing the bulk of the colours in my collection as the bottles are larger than the caps. I do have troubles with rounded stamping bottles with the black caps so I was hoping that the UberSwatchers would fit nicely over them. Sadly, this is definitely not the case. As you can see below the UberSwatchers are way too small. Now while I won't be rushing out to buy the UberSwatchers for my entire polish collection (I have over 2500 polishes) I do like the UberSwatchers for my gel polishes. Gel polishes are in a black bottle which makes it impossible to see what colour is inside plus the labels on the fronts of the bottles aren't a good colour representation. The UberSwatchers are a perfect solution for that! The UberSwatchers are available in a variety of packs from Uberchic Beauty. I'm a little late to this challenge but I have decided to join in. I joined the Nail Crazies Unite Facebook group last year and had all intentions of starting from the beginning of the challenge but got side tracked by trying to swatch things etc. I then completely forgot about it when I started joining all the other challenge, until now! As you can see I have missed a number of themes but I will be starting from today and working my way through with the rest of the prompts. Fingers crossed I can keep up. Anyway, today's theme is blue and white. I went for a nice simple mani. For my base I used OPI Alpine Snow and then stamped Bundle Monster Astronomical and Cosmic Latte. 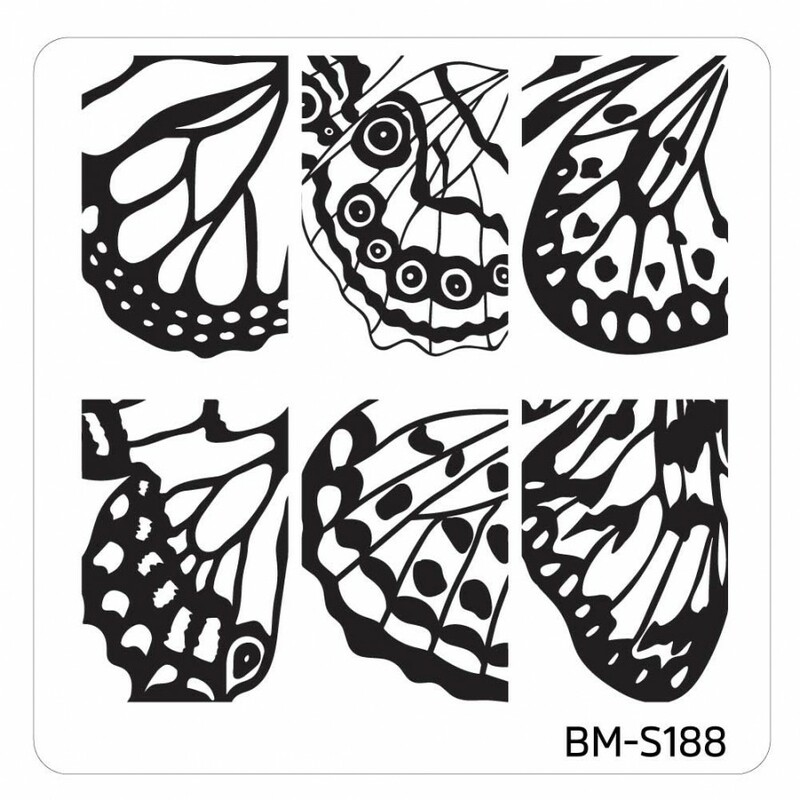 Stamping designs are from Uberchic Beauty 14-03. I actually really like the little triangles by themselves. 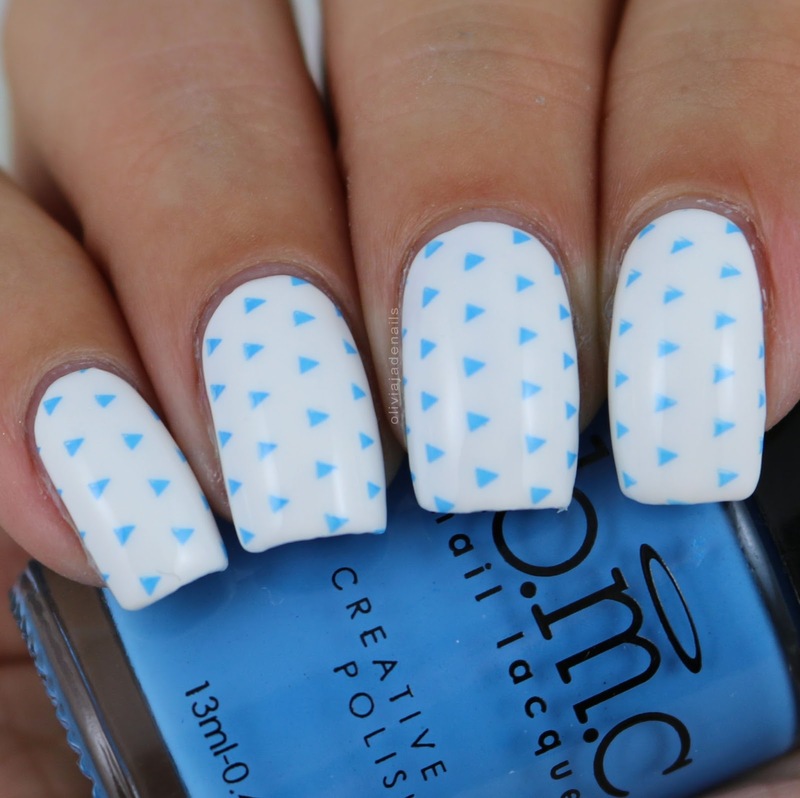 I think that make for a really cute and simple mani. 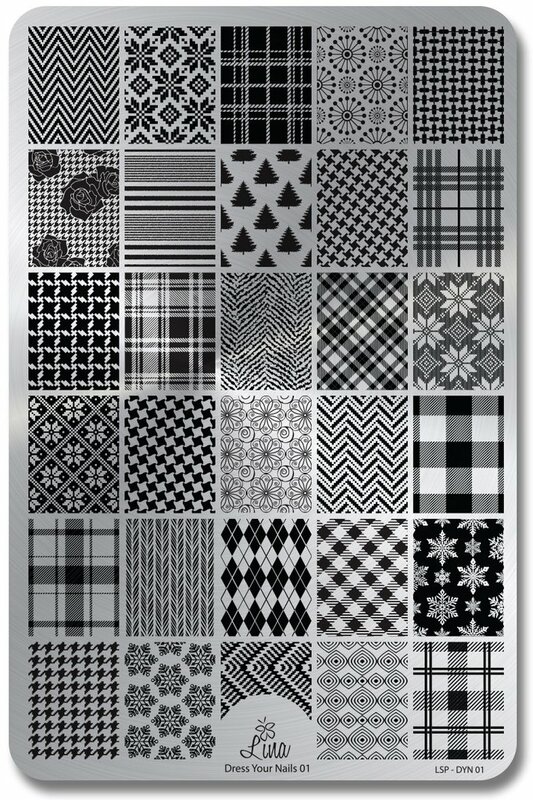 I think next time I will do some double stamping with this image. Have you been joining in with this challenge? Today I have a completely different post for you. Well maybe it's not completely different as it is still nail polish, but today I have gel polishes from Opallac Gel Polish to share with you. I was sent a seventeen polishes to swatch so I have decided to split them into two posts. The second part I'll post probably in a couple of weeks, as I'll need the time to swatch them still (gels definitely take me longer to swatch than regular polish). Today I have nine of the polishes to share with you. I haven't ever tried gel polishes that require a lamp to set them so this has definitely been a bit of a learning curve for me, and a very steep learning curving at that. I spent the first three days (and countless hours) trying different ways of applying the polishes so that they didn't bubble on me. From shaking the bottle (which you are instructed to do to ensure the polish is mixed) and not shaking to bottle, I tried thin coats, medium coats and thick coats and it was nothing but frustration. I asked around and apparently no one had experienced this so I emailed Opallac to see if they could help. Turns out there must have sent a faulty top coat so I used the back up bottle I had. Did that help? Yes, kind of. I still do get bubbling in the polishes (including the top coat) but not as bad as the original few days. As I mentioned using these gel polishes has definitely been a learning curve for me. If you apply them like a regular polish they pool and slide off the nail and are an absolute pain to clean up. I found if you applied them too thin then they bubble like crazy and you have to use multiple brush strokes to try and get the bubbles out. From what I can gather I seem to be the only person who has experienced this issue, so I am going to guess that it must be a body chemistry thing that is causing them to bubble on me. Each of these polishes need to be cured for 90 seconds under the UV lamp. I did notice that the lamp does cause the polish to shrink/move a little so I definitely recommend wrapping you tips so it's as bad. Once the polishes are cured you can't do any form of clean up (which personally was driving me nuts!) so I do apologize that I don't have nice clean lines on some of my swatches. Right I think that about sums up my experience so let's take a look at the swatches shall we? 24 Carats is a gold glitter in a clear base. This polish didn't come with a label attached so I am taking a bit of a guess that this is the name. Now I am not sure if this is designed as a glitter topper or is meant to be worn alone. I decided to swatch it by itself, because why not? This is super sparkly so I would suggest avoiding driving with sunlight because you may get blinded. My swatch shows three coats. Appletini is a pastel green creme. This one does apply quite unevenly and needed three coats to even out. I think it is a pretty colour. I used three coats for my swatch. Babes In Bondi is a pastel peach creme with a very subtle shimmer. I used three coats for my swatch. French Affair is a white creme. You can never go wrong with white nails. This one is nice and opaque and only needed two coats to be opaque. I did notice that this one came off slightly when applying the top coat (you could see white on the top coat brush). Go Gaga is a fluro pink. This one is quite sheer in colour. I used four coats for my swatch and still had a slight visible nail line. I think this one would be better over a white base. Popsicle is a bright purple creme. I think this is such a pretty colour. For my swatch I used two coats. Scarlet is a watermelon creme. This one actually surprised me. I thought it was going to be a red (the labelling looks red and the name suggests red to me). I used three coats for my swatch. Strawberries & Cream is a thermal polish that shifts from a cream colour to a pink. This definitely quite interesting to watch. When you apply it, it starts as pink but immediately changes to cream once it is on the nails. Even with my long nails the polish remained in the warm state. To get to show the pink I needed to ice the tips. I should point out that it wasn't particularly hot when I swatched this one either. I think they are just very reactive. My swatch shows three coats. True Blue is a blue creme. I really like the colour of this one. My swatch shows two coats. I haven't actually worn any of these polishes for more than 24 hours so I can't comment on their wearability. They are designed to last up to fourteen days which is great if you don't switch up your polish often. For someone like me who switches up their nails on a daily basis, I don't think these are worth the extra effort (especially seems I get some bubbling as well) it is to apply these and then to remove them. My nails and cuticles certainly aren't liking how drying the remover is either. 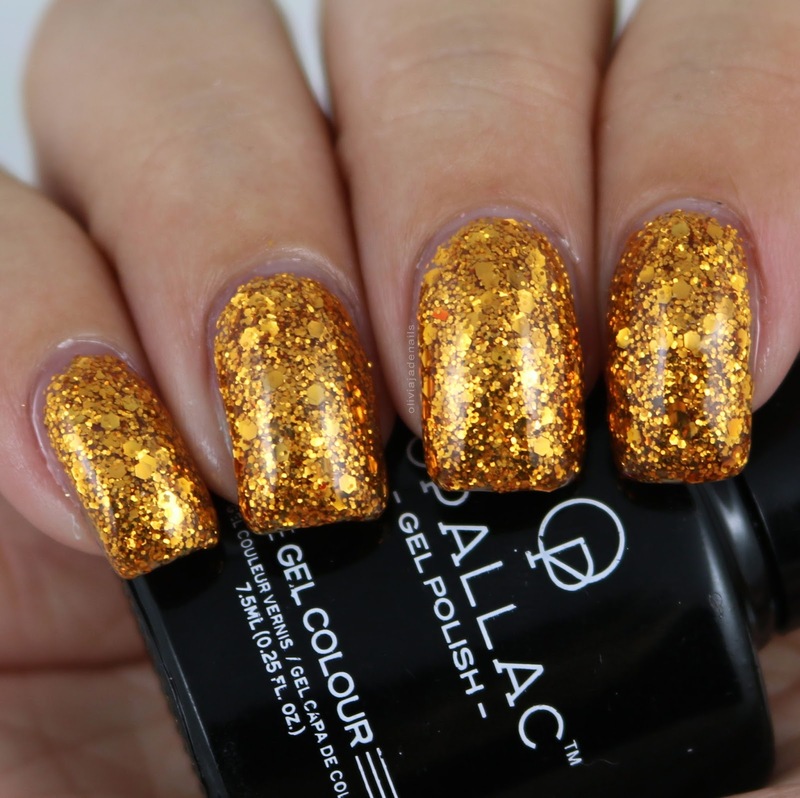 Opallac Gel Polish are available at Priceline and from the Opallac website. Today's theme for the 30 Days Of Colour Challenge is jewels. Now when I saw this theme I thought it was the perfect opportunity to play in my stud drawers. Yes believe it or not I do own a lot of studs and other nail art things but don't use them very often. Why? No clue. There really is no good reason. Anyway, I have been busy swatching some gel polishes (which I will being a post about tomorrow) and thought why not team the gel polishes with some bling? This definitely isn't a mani that I would wear on a day to day basis but it was fun as a once off thing. I used Opallac Gel Polish in Babes In Bondi and the rhinestones are from Born Pretty Store. I'm excited to see what everyone else comes up with for this theme! I'm sure by now you are all aware by now that I have a lot of untried polishes....well the same can be said about my stamping plate collection as well. Why am I mentioning this now? Well it has occurred to me that while Uberchic Beauty have just released their Love & Marriage 03 Stamping Plate (there are also a couple of other new releases which I will be sharing with you soon) I still haven't gotten around to swatching and reviewing Love & Marriage 01. I think I have used it so that is at least a good start. I have got a blog post on Love & Marriage 02 if you are interested. Anyway, let's look at the third addition to this collection. This is a mani I actually did for a challenge over the weekend. I love the lace of the mint! Such an unexpected combination (well at least for it is unexpected). 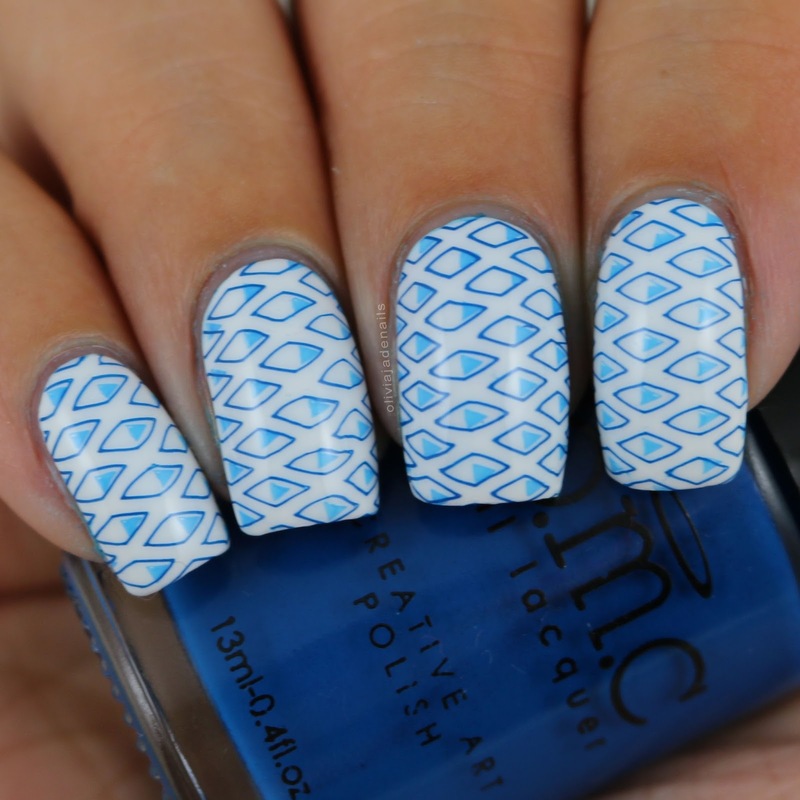 Polishes used are China Glaze's Re-fresh Mint and Powder Perfect's White Stamping Polish. For my second mani I actually used two different stamping images from this plate. The stripes are actually vertical on the plate (with hearts on top) but they fit horizontally across my nails. It's like two images for the price of one. I love the stripes teamed with the hearts image. I can see me using this heart image a lot, especially with Valentine's Day just around the corner. Polishes used for this mani are Opallac Gel Polish's Go Gaga, China Glaze's Glistening Snow and Powder Perfect's Black Stamping Polish. I think this is a great plate, especially if you are like me and love girly images/manis. As always the images on this plate stamp beautifully. 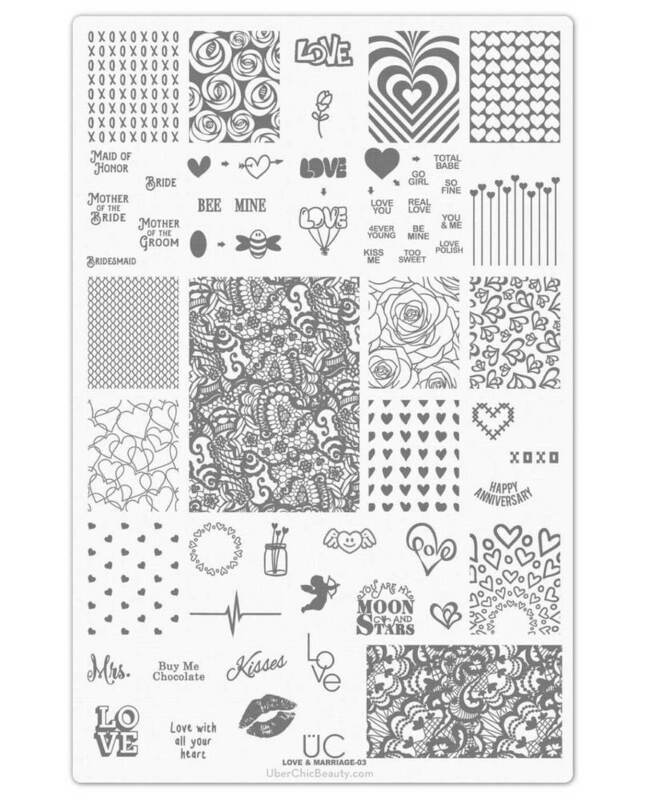 The Love & Marriage 03 Stamping Plate is available now from Uberchic Beauty. Today I have the last winter look that I will be doing for the Nail Challenge Collaborative. I was actually a little stumped with what to do for my last mani so I was scrolling through my winter board on Pinterest when I saw a pink and black snowflake mani by @glittr and just knew I had to do something very similar. For this mani I used OPI's Mod About You, China Glaze's Glistening Snow (which side not: is drying out nooooooo), and Pretty Serious Cosmetics Absence. For my stamping I used Powder Perfect's Black Stamping Polish and the image is from Lina Nail Art Supplies 4 Seasons - Winter 01. I'm not too sure if I will be joining in again with this challenge next month (I can't believe it's already time to start thinking about February already!). It really will depend completely on what theme is picked. Are you going to be joining in with The Nail Challenge Collaborative? Today is one of those days where I feel like I am chasing my tail and going around in circles. Ahh! Hopefully I can get everything I need to get done. All that being said I am going to make today's post a quick one. Today's theme for the 30 Days Of Colour Challenge is Calm. This theme really could go any which way but I thought I would go for a nice pastel colour and a simple design. I originally was going to use China Glaze's Keep Calm, Paint On but switched to Re-fresh Mint. They are quite similar colours, except Re-fresh Mint is a creme polish. Fun fact: Re-fresh Mint was the first China Glaze polish that I ever purchased and it was the polish that really pushed me away from my "buy only OPI polishes". It's great to revisit this polish. Anyway, I decided to stamp this really pretty lace image from Uberchic Love & Marriage 03 stamping plate (I will have swatches and a review of this plate for you guys next week). I think that the mint is such an unexpected colour for a lace mani. Or maybe it's not unexpected at all, except to me. I usually go for pinks, nudes or even reds for lace. No idea why. Right, now I must get moving. I hope you all have a great day! Well, well look at me switching gears here. This is my first blog post that isn't nail art related since January 5th. That's right, that is fifteen days of non stop nail art. There has been a mix of nail art challenges, nail vinyls and stamping plate reviews but now it's time for me to get back into swatching some of the polishes that I purchased last year. I really want to get through these before I go back into buying season with all the new polishes that are going to be soon released. I have had these five Emily de Molly polishes waiting for me to swatch them since June last year. How crazy is that? There was actually six polishes released and I did manage to swatch one of them last year before I had a major break in my nail and was forced to take a break. In case you missed the post with Quest For Immortality you can find it here. This polish was actually in my favorites from last year. It is such a gorgeous polish, I seriously love it! Anyway, I should stop babbling and show you guys the other five polishes that were released in June last year. Crystal Cavern is a lavender pink foil with gold/green/blue shifting shimmer. This is a really pretty colour. I couldn't stop looking at my nails when I wore this one. The colour is a little on the sheer side. I used three coats for my swatch. Cubicle Gangster is a bright green creme with an orange overlay. This is definitely unique in my collection. It's not a favourite of mine but I still quite like it. The formula is great and easy to work with. I used two coats for my swatch. Damaged Bills is a dark teal with overlay. Another really pretty polish with an amazing formula. My swatch shows two coats. Hybrid Theory is a light blue strong holo with green to copper multichrome flakies. OMG this polish is amazing! I am so disappointed with myself that I haven't worn this until now. Seriously Tracy? Why? It's so stunning, and the formula is so easy to use. I should also point out that is polish is a lot more holo than it looks in my sunshine pic. I took that picture early in the morning so the sun wasn't as strong. I stupidly forgot to take another picture when the sun was stronger. I used three coats for my swatch. Lunar Haze is a light green holo with very slight beige undertones and orange overlay. It also has iridescent purple microflakes (which are visible in person but my camera didn't pick them up too well in my pictures). This is another really pretty polish that would also make for a fantastic base from some nail art. The formula is easy to use. I used three coats for my swatch. Emily de Molly really does make some of the best polishes in the business if you ask me. I am such a HUGE fan, which really isn't new information. You guys would probably already know that. I'm definitely excited to see what Hayley has in store for us this year. I'm just hoping my wallet can keep up. Anyway, my personal favourites that were released in June 2016 were Quest Of Immortality (seriously check it out if you haven't! ), Hybrid Theaor and Crystal Cavern. All of these polishes are still available now from Emily de Molly's Australian site and I am guessing they are still available from the international site. If not, check out one of Emily de Molly's stockists.